Established in 1977, GSM Driving Academy is one of the oldest running driving schools in East London. The school covers the entire East London area, it has male and female driving instructors and provides both manual and automatic driving lessons. They also offer a wide range of courses including motorway lessons, night tuition and driving crash courses. GSM prices fall in the average for the East London area. They have good introductory offers, for example 4 manual driving lessons for £56 and this works out to be £14 per hour. Prices are split by location and type of vehicle, but it is relatively easy to find the lesson type you are interested in and how much you will pay. Before booking it is worthwhile thinking about what time of day you would like to have your lessons as their prices differ between daytime and evening. For example a standard block booking of 5 lessons costs £90 on a weekday and £95 on a weekend. Your choice of payment method also influences the amount you pay. If you pay by Paypal the weekend block of 5 lessons will cost you £100, instead of the £95 mentioned above. 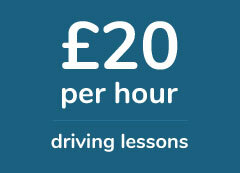 Their clear pricing structure also makes it easy to calculate the total cost of your driving lessons. The pricing page clearly state the price of introductory lessons and what the cost of lessons will be, once the initial driving are complete. Many other driving schools in the area do not advertise how much it will cost once the introductory deal has ended and this can lead to surprises for the student. On Facebook, GSM have 1,044 likes and 1010 followers. Their profile highlights their recent passes and their wall contains messages from ex-students. You can’t leave reviews on their page, however you can post on their wall if you need to. The school does respond to negative feedback left on their profile too. We have seen posts where students have complained, a representative of GSM have responded and later the student posted a positive comment once their issue was resolved. Seeing the company respond in this way shows it takes customer service seriously. The school also has a twitter profile however it does not seem to be active. The profile has 148 followers but has only tweeted 3 times. The last tweet was sent in 2014, so it is safe to say it is not a profile they are keeping updated. Based on reviews found on Google and Yell.com, GSM Driving Academy is well thought of. On Yell.com, the driving school has 4.3 out of 5 rating based on 17 reviews and on Google, it has a 4.2 out of 5 rating based on 34 reviews. One instructor who stood out from the reviews on both platforms is Harpreet. From the comments left, she is very patient and professional and students regularly mentioned her friendly nature. GSM online will help reschedule your driivng test for you for £30. Once you have chosen your driving test centre and booked a test, they will search for an earlier date and book this for you once you have confirmed. Payment for the this service is made via Paypal. I really enjoyed learning to drive with GSM. I passed at the second attempt with only one minor and it's all down to my instructor Harpreet. She was super patient with me and gave me lots of confidence, I highly recommend! Would just like to say that GSM are a great school and they helped me get my drivers license. I had 30 driving lessons with them in total and it was definitely money well spent. Satisfied with the standard of teaching but a few late cancellations made things tougher than they should have been. Overall though, GSM were good.